Oh forget it. It’s totally my fault. I can’t help myself. Not only do I imagine myself to have hoards of anxious fans waiting for my brilliant purim ideas yeah right but I also need to impress people at my own purim seudah (feast/party). It’s hard, let me tell you. No matter how much pressure you might feel at parties, think about what it’s like when you are a food writer. Exactly. 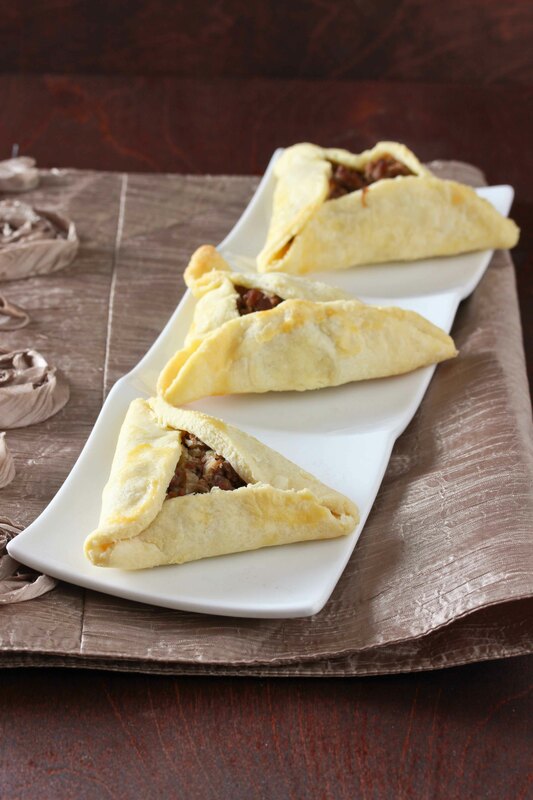 Well I kinda wish I could invite each and every one of you to my purim party, because I am serving these meat pie hamantaschen as the appetizer and they are seriously delicious. But sadly I can’t invite you all. Luckily I can share this awesome and gorgeous recipe with you. Make this! Place the flour and salt in the bowl of a food processor and pulse quickly to combine. Cut the frozen margarine into cubes and sprinkle over the flour mixture. Pulse in sort on-off bursts until the mixture resembles coarse crumbs. Add the ice water, starting with 6 Tablespoons, and pulse until the dough comes together. Add additional ice water until dough just comes together. Do not overwork the dough. Remove the dough from the bowl and place in a bag in the fridge for a couple of hours or overnight. Heat the oil in a large frying pan. Add the diced onions and sautee for a couple of minutes until translucent. Add the meat and stir to break it up as the meat cooks. You don’t want to leave any large pieces of meat. Add the garlic, salt and pepper and sautee for about a half an hour, until cooked through. Taste and adjust salt and pepper to taste. On a lightly floured surface, roll out the chilled dough to about 1/8th of an inch. Cut out rounds about 4-5 inches in diameter (you can use a smaller circle if you want to make this smaller, but watch the baking time.) and set aside. Re-roll the scraps and repeat until all dough has been shaped into circles. If making this for an occasion other than purim, place the filling in the center and fold over for a half moon shape. Brush the beaten egg over the tops of the hamantaschen, if desired. Place on lightly greased cookie sheet and bake at 400 degrees for 15-18 minutes, until just turning golden on the outside. Is that a napkin? A place mat? I love it! What a tremendous idea for the Purim seuda, love it! How will the crust stay shut? I love this idea! Never tried making these at home before, but you’ve inspired me! What a fun idea. 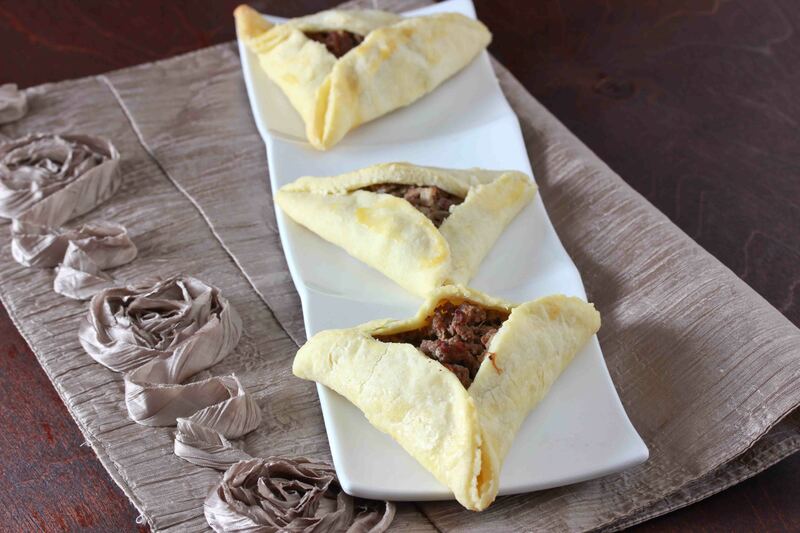 Such a great idea to shape a galette into a hamantaschen. Now I want to try making my galette’s in all new shapes! These sound amazing. I am going to make them for our seudah! Excellent. I’m going to make these as one of the main course options! It’ll use up all the beef mince in the freezer and all my spare flour before pesach… everyone wins! These are so pretty. You really outdid yourself Miriam. I have never made these but really would love to try. I made savory hamantashen one year for mishloach manos. Except I took the easy route and purchase premised and cout into rounds sambusak and pizza dough. Worked just fine for me. I made my filling much more seasoned than yours… More like Sefardic lagmaghine, except no prunes. I used onions, garlic, a touch of tomato paste, lemon juice, pepper, salt, allspice, cinnamon, and a bit of honey along with the ground beef. Sprinkled the underside of the dough with sesame before baking. Made homemade hummus to go along with it, and gave it with a beer and pickle-in-a-bag all in an ice bucket. Sorry, should have read premade and cut into rounds…. Okay, so I made them and froze them (hope that works!) – They worked well – only one opened slightly on one edge but still useable…. and I let them get go golden brown. Thanks Miriam! Hi if we don’t have time to make the dough is there an easier option ? 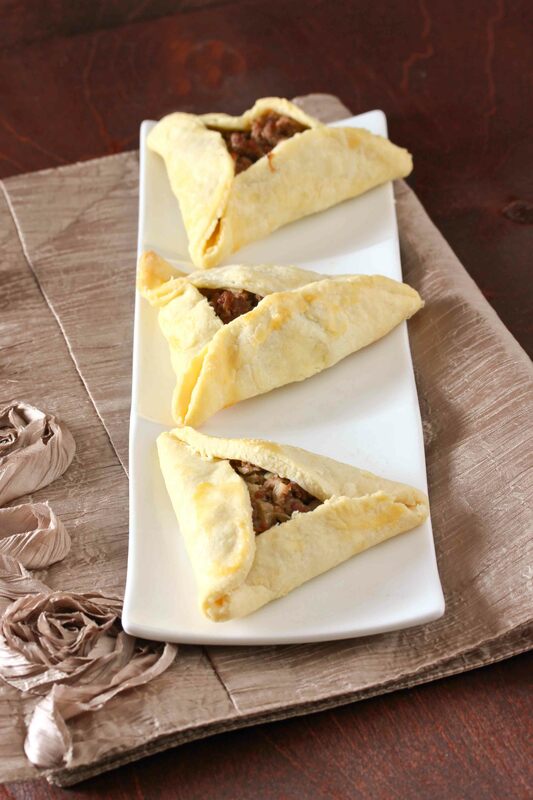 You can use this filling with flaky dough or with store bought frozen pie crust. I made these just now for the Purim Seuda because I hate doing things last minute. I used sambusac (sp?) dough like someone suggested and they came out delicious and crunchy. Now I am concerned about rewarming them. How would you suggest doing that without them becoming too overdone and too crunchy? I realize now I should have frozen them raw. I don’t have a food processor. Should I rather use a blender or a mixer? Can these be made in advance and frozen? I know this is from years ago, but it’s that time again…would you serve it with a sauce, or does it work by itself? It’s good by itself, but I like to serve it with an onion or mushroom sauce.